Biohazard Gorillas stare at you with completely open eyes, without any hint of self-consciousness. Endlessly curious, totally impulsive, with a remarkable alertness and energy that it ‘s impossible not to like. With the mental agility and openness in small children. Children touch. Words and pictures will too. Read out loud and feel free to misinterpret. Race before reason. Sleepiness and loneliness is life’s greatest obstacles. In an attempt to shape the way we write poetry, we look to our present and dive into the future of darkness and culture. Biohazard gorillas hope to rediscover our history and shape our future. Artist collective “Biohazard gorillas ” were manifested two thousand and eleven at the initiative of Per Blomqvist together with Patrik Blomqvist. So far they have released two poetry picture books and two apps in the AppStore. 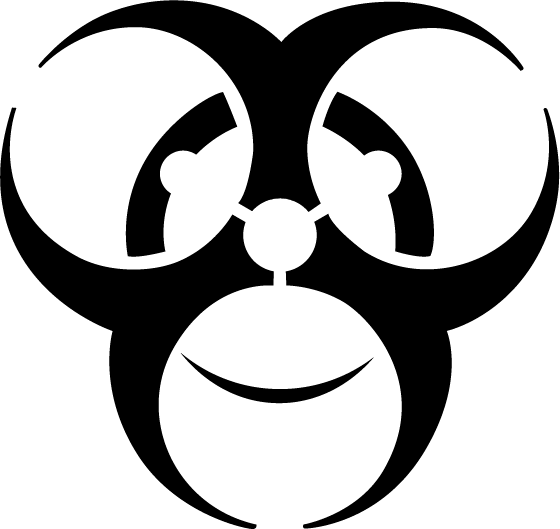 The Collective symbol [the poisonous monkey] materialized with the second book of poems ”Dagen efter orden” and symbolizes Biohazard gorillas’ core values: Mutation, humor and unpredictability.